The Louvin Brothers... The Drunkard's Doom (.mp3 audio 03:16). From the album Satan Is Real (1959, Capitol T 1277). RIP: Charlie Louvin. Hai Bo... I Am Chairman Mao's Red Guard (2000, Inkjet prints, edition 10 of 18). From the exhibition Photography from the New China at the Getty Center. "...In the past 20 years, China's economy has made huge strides to become the second largest in the world. The rapid transition has meant great progress in the way art is taught, made, and talked about in China's flourishing urban centers. Artists who went abroad to find freedom of expression have returned to establish studios and provide mentoring. In an effort perhaps to quiet rebellion and encourage tourism, the ever watchful state now furnishes space, such as the former factory that is now the arts complex 798 in Beijing." Big Shots: Andy Warhol Polaroids of Celebrities at Danziger Projects. "...provides a look at a lesser-known but seminal body of work by the artist who was dazzled by celebrity and found much of his inspiration in the photographic image. Comprised of over thirty Polaroids of subjects ranging from Debbie Harry to Yves St. Laurent and Giorgio Armani to Yoko Ono, the pictures were taken between 1970 and 1986 on Warhol's favorite camera - the Polaroid Big Shot. Created by Polaroid for practical purposes like the quick creation of I.D. cards and passport pictures, the camera's fixed focal length and point-and-shoot mechanism were perfect for the snapshot-loving artist." Japan Exposures... Yu Kusanagi — from Snow. "...When we are looking at a photograph we are not looking at reality. We may not even look at a visual representation of reality. What we see is a photograph, an image realistic in appearance. That photograph’s objective is not to show reality to the viewer, but to construct an illusion of reality within the viewer by evocation of emotions by means of shapes, lightness, darkness and color. Even black and white photographs contain color, they are just not visible as such in the photograph. Yu Kusanagi shows us abundantly beautiful snow. Falling from the clouds, freshly settled on houses, cars and electric poles. The visible onslaught of snow, the sheer quantities and somehow even vigor almost seem threatening, and in truth, they probably are. Yet, what is more peaceful in appearance than a world padded with soft, immaculate white?" Andy Warhol: Motion Pictures at MoMA. "...Andy Warhol: Motion Pictures focuses on the artist's cinematic portraits and non-narrative, silent, and black-and-white films from the mid-1960s. Warhol's Screen Tests reveal his lifelong fascination with the cult of celebrity, comprising a visual almanac of the 1960s downtown avant-garde scene. Included in the exhibition are such Warhol "Superstars" as Edie Sedgwick, Nico, and Baby Jane Holzer; poet Allen Ginsberg; musician Lou Reed; actor Dennis Hopper; author Susan Sontag; and collector Ethel Scull, among others." William Garnett, An Aerial Aesthetic at Scott Nichols Gallery. "...A pioneer in the field of aerial photography who has received three Guggenheim fellowships, Garnett took a highly mechanized and utilitarian process and transformed it into a art form of power and beauty. It was luck that brought William Garnett to aerial photography. Discharged from the Army in 1945, where he served as a motion picture cameraman for U.S. Signal Corps he found his life's work on the plane trip back to the east coast in the navigator's seat of a troop transport. Inspired by the majesty of the landscape below, he decided to get his pilot's license and start photographing from the sky. He learned to fly on the G.I. Bill and bought his first plane in 1947, which served as his tripod and studio, throughout his career." Charles Johnstone: Thirty-four Basketball Courts at Joseph Bellows Gallery. "...It doesn't take long to recognize that ultimately these photographs aren't really about basketball courts at all, but about the city that surrounds them. Within their self-imposed framework, these photographs deliver a wealth of observation. Rows of windows climbing the façade of an apartment building, each the repeated echo of the backboard below. The busy, arching branches of winter trees tracing across the frame, set against the immobile geometry of the key and the three point line. Shadows dappling the court, giving us the hint of what lies just beyond the edge of the image. Brick and glass and concrete, surfaces and textures that are part of the invisible background as we make our daily rounds, emerging here as part of the vital grid of the city. Perhaps most important is Johnstone's thoughtful and practiced use of color - something far more easily said than done - to bring a subtle but luminous glow to his images." More... Works by Charles Johnstone at his personal site. Rock My Religion (Directed by Dan Graham, 1982-84, 55:27) at Tofu Magazine. "...Rock My Religion is a thesis on the relation between religion and rock music in contemporary culture. Graham formulates a history that begins with the Shakers, an early religious community who practiced self-denial and ecstatic trance dances. With the 'reeling and rocking' of religious revivals as his point of departure, Graham analyzes the emergence of rock music as religion with the teenage consumer in the isolated suburban milieu of the 1950s, locating rock's sexual and ideological context in post-World War II America. The music and philosophies of Patti Smith, who made explicit the trope that rock is religion, are his focus. This complex collage of text, film footage and performance forms a compelling theoretical essay on the ideological codes and historical contexts that inform the cultural phenomenon of rock `n' roll music." David Wojnarowicz "A Fire in My Belly"
David Wojnarowicz "A Fire in My Belly" (Excerpt, 1986-87, Super 8mm film, black and white & color, Running time: 00:04:00) at Greg Kucera Gallery. 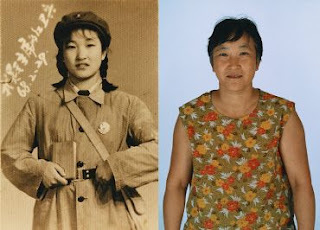 "...This is the version of David Wojnarovicz’s film that was shown at, and has since been censored by, the Smithsonian National Portrait Gallery. It was initially edited by curators Jonathan Katz and Bart Everly with audio from an Act Up march in which Wojnarovicz’s voice can be heard." The Extra/Ordinary World of Pentti Sammallahti at Nailya Alexander Gallery. "...From early childhood Pentti Sammallahti (b. 1950) was drawn to photography. Growing up, he was surrounded by the works of his grandmother, Hildur Larsson (1882-1952), a Swedish-born photographer, who worked for the Helsinki newspaper Kaiku in the early 1900s. After visiting The Family of Man exhibition at Helsinki Art Hall (1961) Sammallahti made his first prints at age eleven. Pentti joined the Helsinki Camera Club in 1964. His first solo exhibition was in 1971." Daniel Naudé... Africanis 18. Murraysburg, 10 May 2010 (C-print). From the exhibition Daniel Naudé: Animal Farm at Michael Stevenson Gallery in Cape Town. "...Naudé began this series during a road trip from Cape Town to Mozambique in 2008. In the desert plains of the Karoo, he saw a feral Africanis dog which stared back at him for a spilt second before lurking away with its mouth foaming, its manner expressive of rebellion. The encounter led Naudé to contemplate the nature of mankind's dominion over animals, and the way in which the histories of man, animals and the landscape have become entwined and indivisible over centuries. The naturally crossbred Africanis, with a lineage extending back to ancient Egypt, seemed to Naudé to reflect our complex South African culture and identity in an inexplicable way. While taking his initial series of Africanis portraits, the quote by Franz Kafka: 'All knowledge, the totality of all questions and all answers, is contained in the dog', resonated in his mind." David Plowden... Mayetta, Kansas (1991). From Works by David Plowden at the Beinecke Rare Book and Manuscript Library at Yale University. 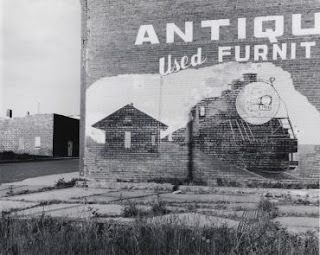 "...For five decades, the photographer David Plowden of Winnetka, Illinois, has documented America’s vanishing landscapes and artifacts, his stunning black and white photographs forming an image of life in 20th-century urban and rural America. 'I have been beset,' Plowden says, 'with a sense of urgency to record those parts of our heritage which seem to be receding as quickly as the view from the rear of a speeding train. I fear that we are eradicating the evidence of our past accomplishments so quickly that in time we may well lose the sense of who we are.'" Concrete Improvisations: Collages and Sculpture by Esteban Vicente at the Grey Art Gallery, NYU. "...For five decades Esteban Vicente (1903–2001)―an integral member of the New York School―explored color, form, and texture in vibrant paintings and inventive collages. Whether using paint or cut-and-torn paper, he crafted his works with painstaking care, attentively layering abstract shapes and varied hues. Vicente’s very early collages, however, also exude Abstract Expressionism’s spontaneity, prompting critics to dub him a pioneer of 'action collage.' Indeed, this medium was as important to Vicente as his painting, and collages often made up half of his annual output. Later works feature bold, geometric forms that showcase luminous colors and delicately shifting tones. He also created small-scale sculptures called 'toys' or divertimientos, which he cobbled together from bits of wood and other detritus scattered about his studio. Thoughtful yet lighthearted improvisations, his “toys” convey the artist’s whimsical side—he was well known for his formal demeanor―and reveal his hands-on, polychrome experiments with three-dimensionality." Paul McDonough: New York City, 1973-1978 at Sasha Wolf Gallery. "...McDonough’s photographs from this time period are characterized by the spontaneous aesthetic of street photography wherein both the photographer and the subjects are often in motion. There is no stopping to get to know one another. Just a lot of walking on by. But there’s an intimacy in this body of work." Antonio Caballero: Las Rutas de la Pasión, Mexico 1960's-1970's at Sikkema Jenkins & Co. in New York. "...During the 1960s and 1970s, Antonio Caballero was a prolific maker of Mexican fotonovelas, a kind of photography-based graphic novel form, filled with soap opera-style narratives of love and betrayal. By taking them out of their original sequenced context and blowing them up to large scale, this show takes these dated pop culture images and re-characterizes them, highlighting their entertaining retro-melodrama." 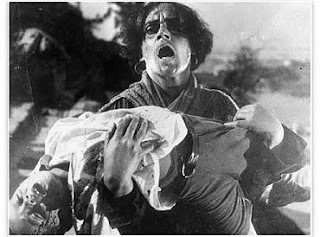 Sergei Eisenstein's Battleship Potemkin at Film Forum in New York. "...One of the genuinely exciting legends of the cinema, Eisenstein’s epic revolutionized screen editing, treatment of violence, and propaganda: the Battleship Potemkin incident, conceived as a single episode of a planned pageant on the 1905 revolt, in celebration of its 20th anniversary, comprised only one-half page of the original script. The devastating 'Odessa steps' sequence ('a few minutes in cinema as brilliantly organized as a movement in a Beethoven symphony' – James Agee), conceived by Eisenstein only when he arrived on location, is still perhaps the most famous, anthologized, and imitated in film history." in almost every picture #9 - photographs collected and edited by Erik Kessels, text by Christian Bunyan. "...This book deals with one family’s attempt to solve one of the great mysteries of photography: how to shoot a black dog. This in almost every picture alludes to that point, showing what happens when you’ve got a camera that makes July look like December in Helsinki. Oddly enough, the results are frequently more beautiful than anything that’s been shot by a present day EOS, modified on a Mac and printed on a machine with a brain like HAL 9000." On Duty: Arnold Odermatt at Amador Gallery. "...Originally a baker, Odermatt joined the police force in the Swiss canton of Nidwalden in 1948 at age 23. Never trained as an artist, he served as the official police photographer for more than 40 years, retiring with the rank of First Lieutenant Head of Traffic Police and Deputy to Commander of the Nidwalden Police. His images were discovered by the curator Harald Szeeman, who featured Odermatt’s photographs in the 49th Venice Biennale. In 2002, the Art Institute of Chicago curator James Rondeau mounted a solo exhibition of his work." Dave Dee, Dozy, Beaky, Mick & Tich... Hold Tight (.mp3 audio 02:47 1966, Fontana TF 671, 267550 TF). Le Temps Qu'il Fait. A group show of ten french photographers living in Japan, Institut Franco-Japonais de Tokyo, April 08 - May 23, 2010. Disorder (2009, 58mn, China, eng subtitles) at Tofu Magazine. Cinematography: Cai Cheni, Mu Huang, Ren Lu, Xin Xiao, Yu Zhu, Chun Zhu, Rui Zeng, Shi Zhang. Editing: Weikai Huang, Fang Xiao. Works by Shinji Abe at Japan Exposures. "...Japan Exposures is pleased to present the work of Shinji Abe, who at 26 is one of the youngest — if not the youngest — photographers we’ve featured. It may come as something of a surprise to readers of this website, but Abe is one of a rather sizable group of young photographers who not only embrace film, the darkroom, and the vagaries of the street as their subject, but who also don’t have an online presence. In Abe’s case, he doesn’t even have a personal computer. Whether by design or happenstance, this makes Abe the ideal type of photographer we hope to feature even more on Japan Exposures as we begin 2010 — young, up and coming, and to borrow a phrase coined by noted street photographer Nick Turpin, 'virtually invisible.'" 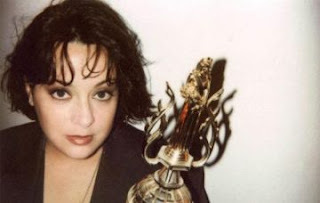 Kelly Hogan & The Pine Valley Cosmonauts... Papa Was A Rodeo (.mp3 audio 04:29). From the album Beneath the Country Underdog (2000, Bloodshot Records BS062). Prophetic Pictures from Menomonie, Wisconsin at the WHS. "...The Visual Materials Archives of the Wisconsin Historical Society holds a most unusual photograph album that takes one back to the future — an imaginary future, that is. The album comprises 32 photographs taken in 1905 of graduates of Menomonie High School in Dunn County. It doesn't describe the students' extracurricular activities nor does it reveal their hopes, dreams and aspirations upon leaving high school. Instead, photographer Albert Hansen and 'prophet' Sarah Ana Heller, both 1905 class members themselves, portrayed imaginary futures for their classmates in words and pictures." Go! Go! Go! by Marie Menken (1962–64, 16mm, color, silent, 12 min). 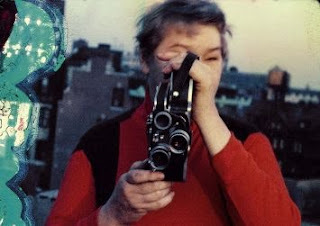 "...Marie Menken (1909 - 1970) became one of New York’s outstanding underground experimental filmmakers of the 1940s through the1960s, inspiring artists such as Stan Brakhage, Andy Warhol, Jonas Mekas, Kenneth Anger, and Gerard Malanga. She was a probable role model of Edward Albee’s 'Who’s Afraid of Virginia Woolf' and ended up as a Warhol Superstar. The documentary allows a glimpse into her social and artistic struggle and radical integrity, drawing the picture of a modern myth in personal diary style." 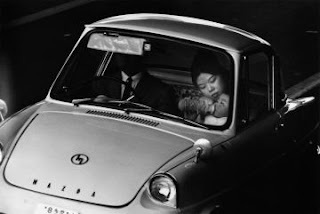 Yutaka Takanashi... Loop Road 7, Suginami-ku (Tokyo-jin 30) (1965, gelatin silver print, printed 1970). From the exhibition Yutaka Takanashi: Towards The City at Galerie Priska Pasquer in Cologne, Germany. 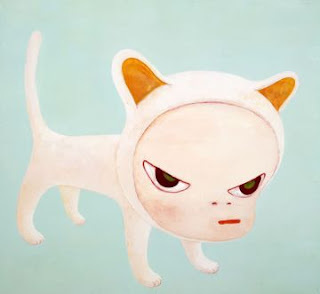 "...In the first overseas solo exhibition to be devoted to his works since the mid-1980s, a selection of Takanashi’s works from the period 1963–1974 will be featured. Yutaka Takanashi was one of the co-founders of the legendary 'Provoke' group which revolutionised Japanese photography at the end of the 1960s. Other members of this group included Daido Moriyamya and Takuma Nakahira. The works in this exhibition were published by Yutaka Takanashi in 1974 in the two-part volume 'Toshi-e' (Towards the City). This elaborate publication marked both the high-water mark and the end of the 'Provoke' era.